Thanks to a special ejecting mechanism, the central rack will automatically pull out when you open an oven door. It will let you take out hot items in a safer and more convenient way. Buttons and dials might seem not sensitive enough. 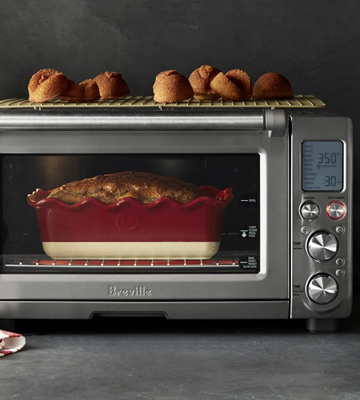 A digital convection oven from Breville is not only a top of the line product in the brand's range but also one of the best models in its class. Fitted with the innovational SMART ELEMENT IQ™ heating system and as many as 10 preset programs, it will ensure maximum even heat distribution and let you cook a variety of dishes without a hassle. 18.5" x 15.75" x 11"
Two cooking racks allow cooking 2 different dishes at a time saving your time and efforts when handling several cooking projects at a time or cooking for some special event. Control panel is prone to fingerprints and needs some extra cleaning. As its name suggests, the Oster Extra-Large Oven stands out from the crowd for its extra-large interior that can accommodate delicious family-sized meals giving you an opportunity to cook for a party, friendly get-together, or a family dinner as quickly and easily as you could only wish. It's a great choice for a big family, small cafe or snack bar. 21.65" x 19.29" x 12.91"
The unit features a roll-top door. Not only does it provide an easy reach to the food but also facilitates cleaning and makes this model a perfect match for concise areas. If you live in a city apartment, studio, simply have a space-limited kitchen or need a convection oven for your small summer house, the Hamiton Beach is by far the best option to go for. Given its pretty compact dimensions, it boasts the capacity of 0.62 cu.ft. and can even accommodate a 12" pizza. 18.74" x 15.24" x 9.41"
The package includes a capacious baking pan that can accommodate a whole chicken up to 4 lbs. Meanwhile, the air fryer basket with high walls will let you roast up to 3 lbs of ingredients. Control dials might get hot during the oven operation. 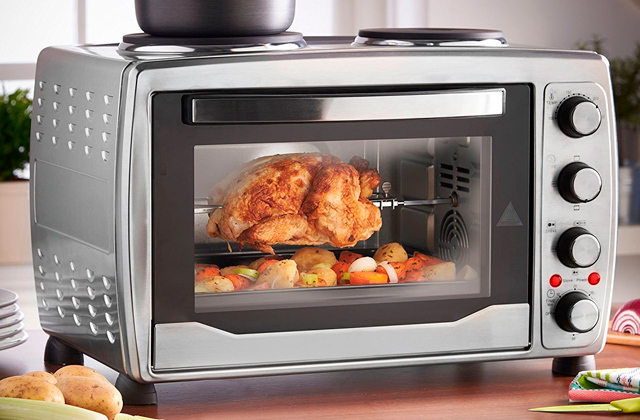 Featuring an air fryer mode, the Cuisinart convection oven will let you cook your favorite roasted snacks in a healthier way and save you the need to buy a separate unit for that. From crusty toasts and broiled treats to appetizing cookies to fritters to fried wings and French fries, you can cook all of this with the Cuisinart. The Interior CeramaShield™ coating boasts increased heat reflection that allows the oven to heat up to the set temperature more quickly. Besides, the coating is scratch resistant and easy to clean, thanks to its non-stick properties. Somewhat noisy fan operation in the convection mode. 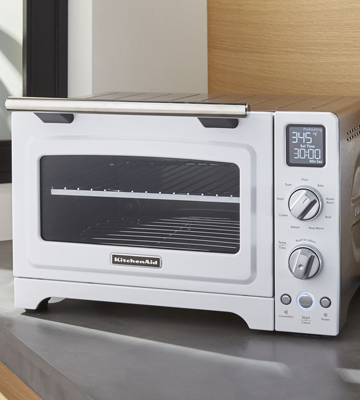 Powerful, functional, easy-to-maintain, and featuring no-frills controls, the KitchenAid digital convection oven will become an irreplaceable kitchen helper both for beginner cooks striving to master culinary skills and for experienced gourmets seeking perfect cooking results. 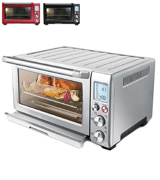 18" x 15" x 13.9"
The Breville Smart Oven Pro is the latest model in the range from a leading kitchen appliance brand. 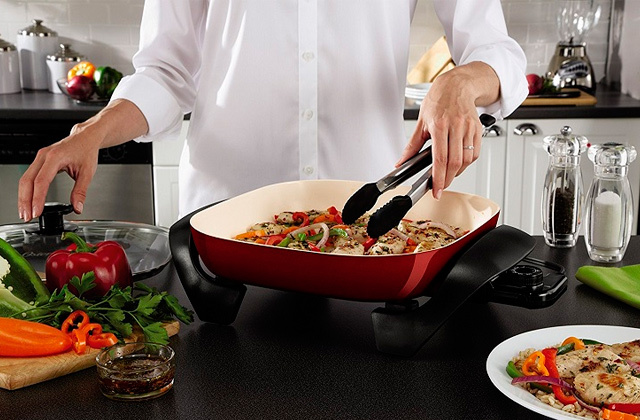 It offers a thoughtful design and the utmost functionality that will make your culinary tasks as easy as never before. The model is called smart for a reason. The unit stands out from the crowd for a branded SMART ELEMENT IQ™ heating system. What’s so special about it you would ask? Unlike heating systems in other models commonly comprising 2 heating elements, the Breville system includes as many as 5 quartz elements (3 on the top and 2 on the bottom). 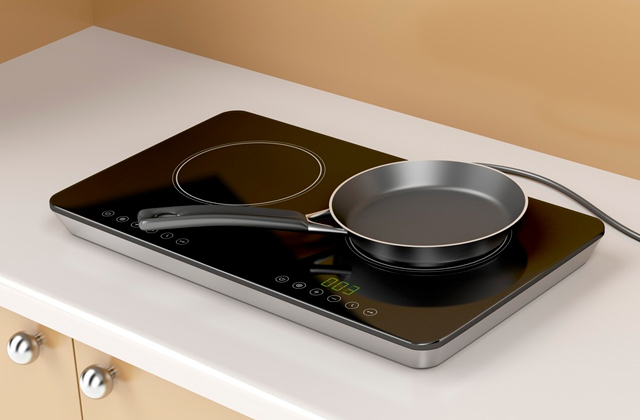 Producing consistent heat, they allow achieving the set temperature more quickly and ensure more even cooking due to precise and fast heat distribution. 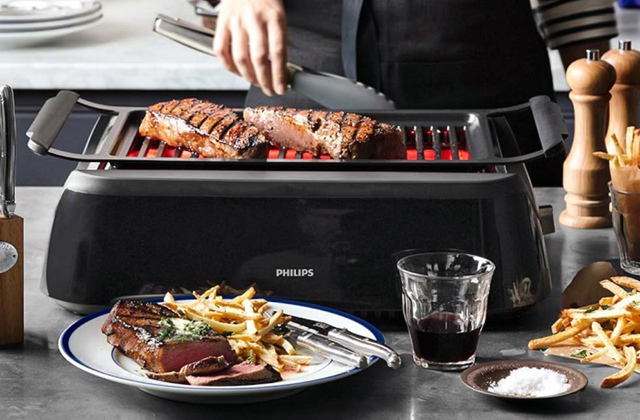 Paired with an impressive unit power of 1800 watts, this feature will let you significantly reduce the overall cooking time and get even better cooking results. The next hallmark of the Smart Pro is that it features 10 preset programs, each taking advantage of a perfectly balanced temperature with time settings to make seemingly difficult cooking chores a cakewalk. 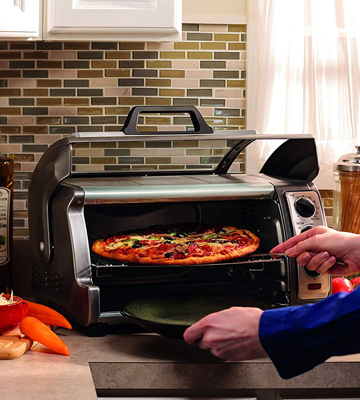 Crunchy toasts and bagels for breakfast, cheesy pizzas for a movie night, succulent roasts for a family dinner, or crusty cookies with chocolate chips for kiddies, you can cook all this and much more with the Breville Smart Pro. And add to that a Slow Cook mode with an automatic Keep warm function for creating mouth-melting stews and a Reheat option to warm up pre-cooked meals, and what you get is the type of oven that can replace any full-size model. The top-of-the-line functionality comes encased in a no-frills design with intuitive controls. All-steel body with an enameled interior is easy to clean and maintain, while 3 control dials with a digital display make the unit operation a breeze. 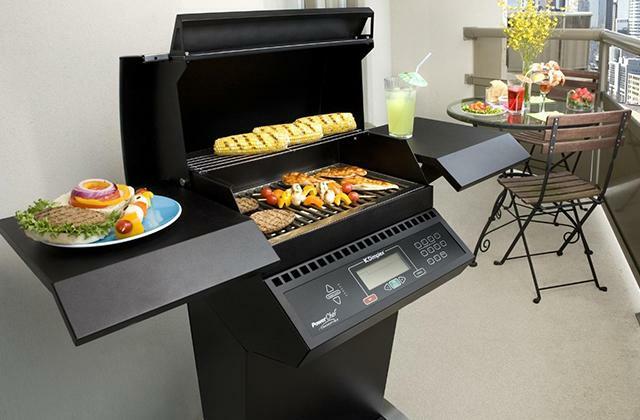 A self-ejecting central rack and a set of accessories contribute to the convenience and ease of use. The Breville Smart Pro digital convection oven fully meets the needs of any modern kitchen and will let you cook like a real pro. For a pricey counter-top appliance it does have many alternative features and it cooks the food very well. Capacity for larger amounts of food are a plus as well! 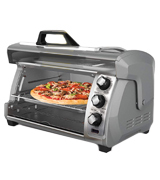 Great oven to cook with, from pizzas, toasts, to anything we want to prepare that fits its size. Very versatile. Great item in our kitchen. Takes a little longer to pre-heat but has a nice timer and easy to read display. Tons of functions. Oven works good. Has a lot of features, and is pretty smart as well. 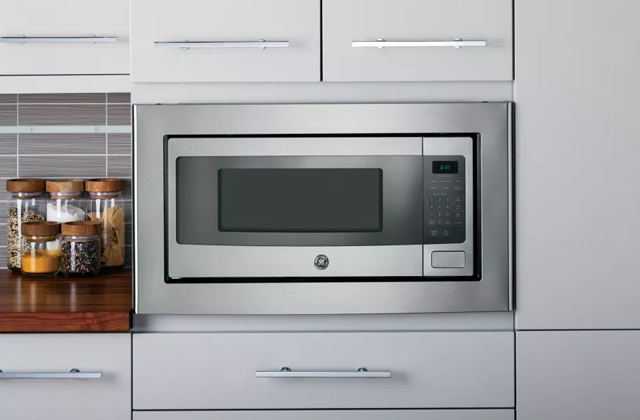 Convection ovens are more compact in size than stand-alone or built-in conventional ovens regardless whether they are wall-mounted or countertop models. That's one of the reasons that mainly bothers consumers. Because convection ovens are so small, many think their cavity capacity is also small, providing enough room only for a single-serve dinner. This is true but not always. The Oster TSSTTVDGXL-SHP convection oven has a generously-sized interior almost as big as in a conventional oven and unlike many others comes with two rather than one cooking racks, allowing for cooking several meals at a time. So what this means is that you can easily cook two 12” pizzas, roast a whole poultry, broil veggies casserole for garnish or toast 18 bread slices and brown bagels at the same time, preparing extra large family treats while spending a minimum of time. Due to bigger internal capacity, the Oster is also a bit bigger in size than other convection ovens. That said, it's still much more compact than traditional ovens and it'll easily find place in your kitchen. The Oster TSSTTVDGXL-SHP looks very sleek and modern. It offers a minimalistic yet well-balanced stainless steel design. On the front, there's a control panel with simple-to-use touch-screen buttons ensuring easy and intuitive operation. 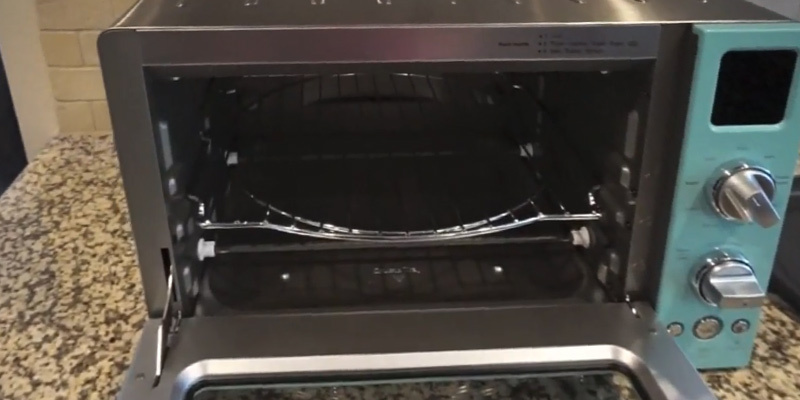 The oven has 5 basic preset modes (Toast, Broil, Pizza, Bake, Broil) and a Turbo Convection function so you can speed up the cooking and improve crisping or browning results. This same function will also come in handy when you want to quickly defrost food. 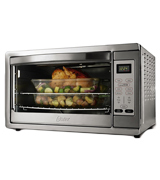 Versatile and functional, the Oster extra-large digital convection oven can make a great alternative to a conventional oven, as well as becoming your helpful assistant when throwing parties. If you don't live in a detached house with a large kitchen and have no luxury of buying just about any kitchen appliance you like, one of the things that will be important for you is how big this appliance is. When you have limited countertop space, every inch counts. Sounds a familiar problem? 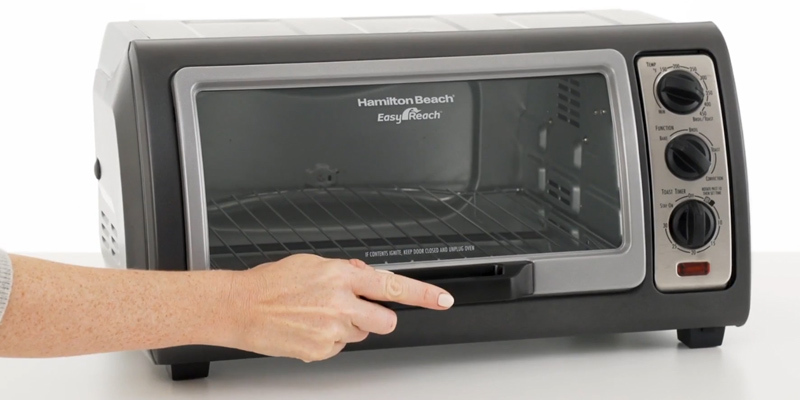 Then we recommend you to turn attention towards the Hamilton Beach 31136 convection oven, one of the most space-saving yet functional models out there. Unlike many similar ovens, this model takes considerably less space due to its special design with a roll-top door that slides up instead of straight out. This means you can easily place anything else in front of it while still having access to it. The large opening makes it easy not only to reach food but also to remove crumbs, juices, melted cheese, etc that may get stuck in the process of cooking. Both the door and the crumb tray are removable so you can easily clean them after use. Despite its small dimensions, the functionality of the Hamilton Beach 31136 is on par with competition at this price point. It has all the basic options you'd expect from a convection oven, and it features convenient controls so everyone can easily use them without any difficulties. There are 3 mechanical dials with the help of which you can adjust temperature settings and cooking time as well as select one of 3 pre-programmed modes. What's remarkable about this model is that its baking and convection functions can be chosen separately. This means you can vary how crispy or delicate your pastry will be. The Hamilton Beach 31136 falls within a budget-friendly price range, making it a real bargain. Of course, that means it doesn't offer prime all-in-one functionality and technological versatility of premium models. But if you're not particularly interested in purchasing a high-tech model and what you want is a small oven for extra help, the Hamilton Beach 31136 can be the best choice. Steaks, pork chops, turkey or chicken breasts with a perfectly golden crust and juicy from the inside, delicious casseroles with awesome crunchy tops, cheesy pizza rolls and toasted sandwiches look appetizing and make your mouth water. 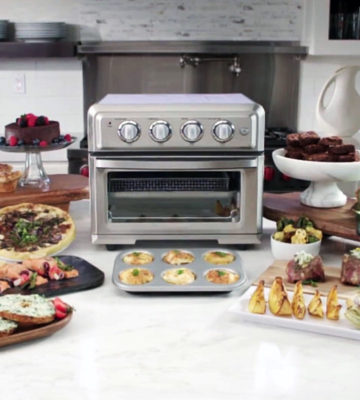 These are only a few dishes you can cook in a convection oven. Roasts really come out awesome from a convection oven. But what about fries? Most models are not meant for frying. If you are a lover of crispy chicken wings, crunchy fried shrimps, fritters, and French fries, you should rather go for a deep fryer or air fryer. Yet, wouldn’t it be nice to have both units? 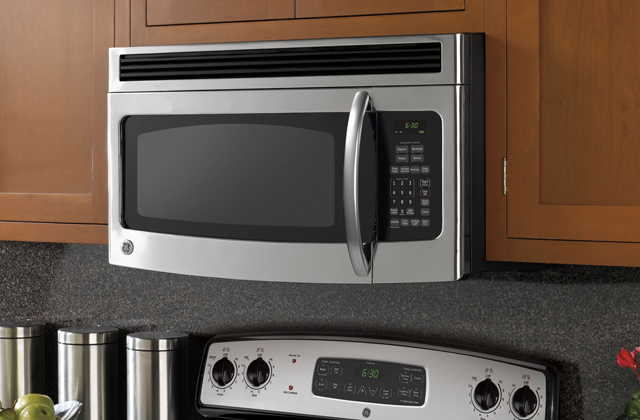 With the Cuisinart convection oven, you can have them both packed in a single countertop appliance. 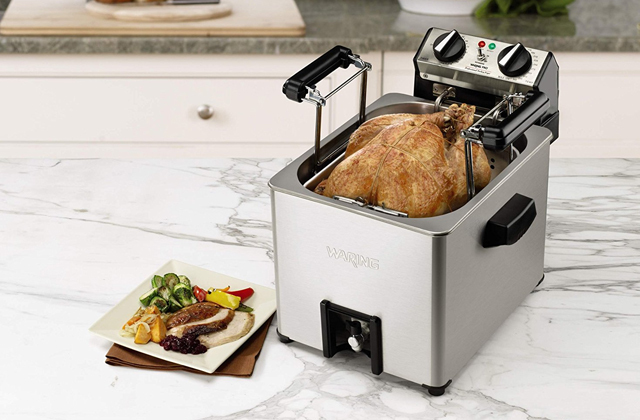 This model comes fitted with a built-in air fryer. Hence, you can use it not only to bake, broil, roast, and warm food but also to air fry it in a healthy way using a minimum amount of oil. As a result, the food will be crunchy and contain little fat. Additional accessories that come supplied with this oven contribute to its functionality, allowing you to cook a bigger variety of meals. The benefits of the Cuisinart TOA-60 do not end here. 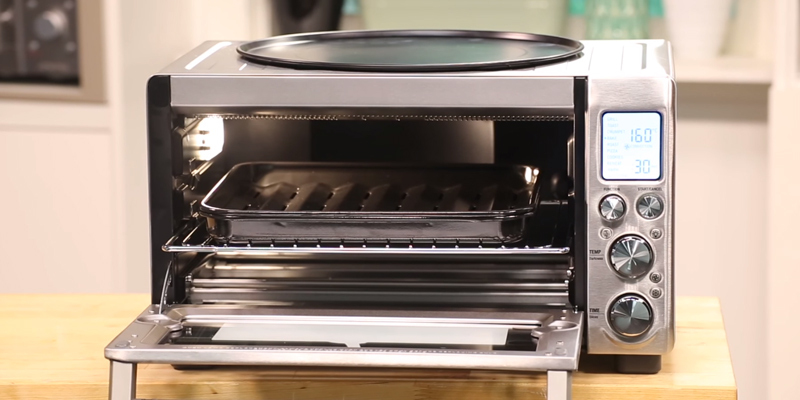 It's one of few convection ovens that also doubles as a toaster. 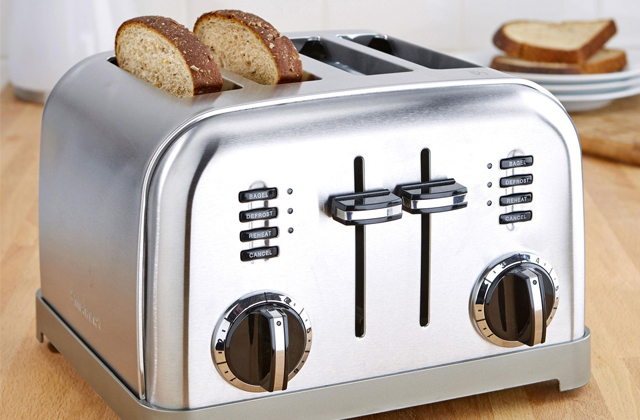 The difference between the Cuisinart TOA-60 and your average toaster oven is in that it has three specific toaster shades with an adjustable timer to choose from, meaning chances of burning bread are greatly reduced. 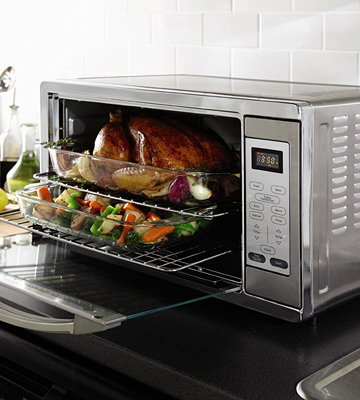 The Cuisinart convection oven is more compact than other units in the range. It will take less space on your countertop, which makes it a great choice for all types of kitchens. However, it doesn’t mean it is less capacious. The oven can accommodate 6 toasts, 12” pizza, 3 lbs of chicken wings, and a 4 lbs chicken. So, cooking a full-scale meal is not a problem. 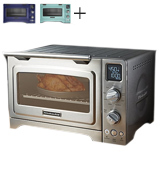 Efficiently combining the functionality of a convection oven, air fryer, and a toaster, the Cuisinart will save you the need to buy several kitchen units and give an opportunity to cook those crispy, crunchy, and perfectly browned roasted, toasted, and fried dainties with a single appliance at hand. 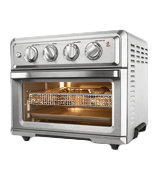 Convection ovens cook faster than conventional ovens and accordingly, consume less energy. With that, top-rated modern convection ovens are similar in performance and functionality to conventional counterparts. All of this, along with the countertop use option, makes convection ovens more compelling for the customers. If you seek full-size oven functionality in a countertop format, this convection oven from KitchenAid definitely deserves your attention. Made of stainless steel, the unit is durable, long-lasting, and easy-to-maintain. The unique Interior CeramaShield™ coating is scratch-resistant and a snap to clean, thanks to its non-stick properties. On top of that, the coating boasts increased heat reflection. In a combo with a high 1800-watt power, this option allows the oven to heat up to the set temperature really quickly. Meanwhile, the convection technology ensures even heat distribution and consistent hot air circulation for faster and better cooking. The model offers 9 pre-programmed functions that will help you achieve delicious and appetizing cooking results even if your cooking skills are only a beginner level. Thus, you can simply select the necessary mode, adjust the cooking time and temperature (under the recipe) and let the cooker do all the job for you. This way, you can bake puffy cakes and convection bake crispy pizzas, broil veggies and side dishes, roast meat, poultry, and fish, toast bread, brown and crisp your foods to perfection. 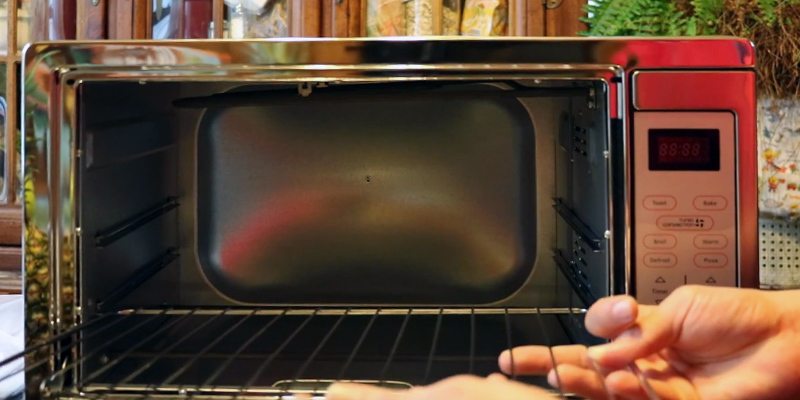 The oven comes complete with an oven rack, a broil rack, and a baking pan that ideally fits into the cavity and features a handy rack guide on the top panel above the door with rack-level tips for different cooking tasks. Cook like a chef, create gourmet meals and enjoy full-size oven performance on your countertop with the KitchenAid digital convection oven. Convection is an efficient heat transfer that occurs due to a quick physical movement of liquids or air. This technology is widely used in manufacturing heating equipment as well as cooking. 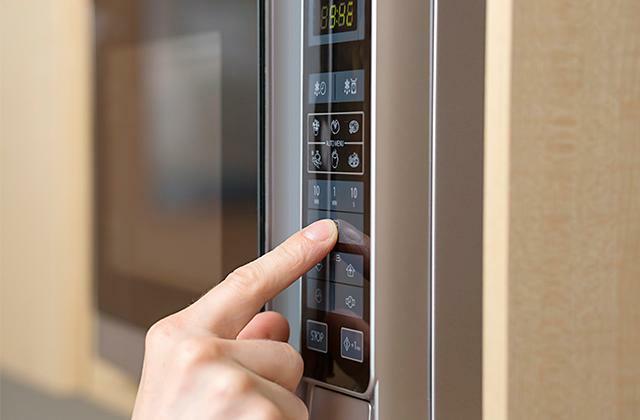 There are plenty of cooking appliances that benefit from convection technology, from halogen ovens to air fryers to microwaves to pizza ovens to conventional ovens with a convection setting and to special true convection ovens. 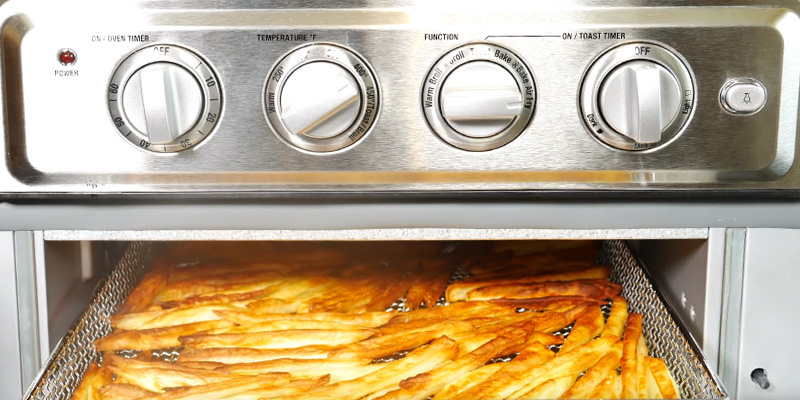 Convection improves hot air transfer and heat distribution for faster and more even cooking. 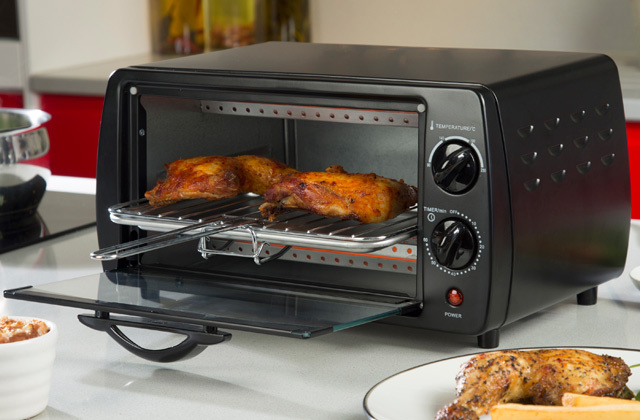 To put it simply, a convection oven is an electric oven with a fan that circulates hot air. As a result, the hot air surrounds food more quickly, and it gets cooked more evenly. This gives you the following benefits: 1) you spend 30% less time on cooking, and 2) food turns out brown and crispy. 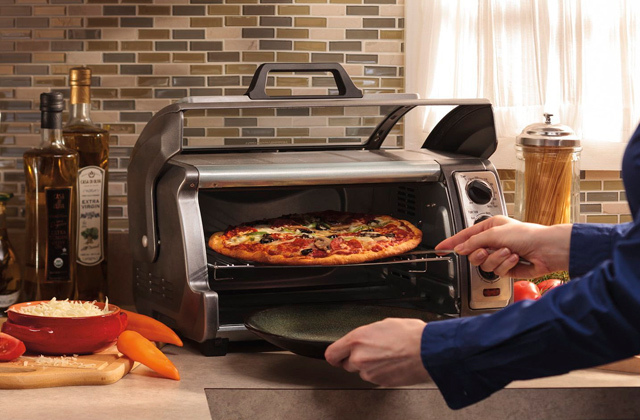 Whether you're a fan of pizza or pastry, the convection oven will allow you to prepare any meal you prefer. Modern convection ovens include digital controls for hassle-free operation, have preset cooking programs that take the guesswork out of the cooking process, and include a number of baking pans, bins, and racks so you can realize different culinary projects. There are even models that combine the functionality of several units. They can toast bread, slow cook, air fry, and reheat precooked foods in the same way as toasters, slow cookers, air fryers, and microwaves do. A convection oven will add functionality to your kitchen and help you expand your cooking horizons even if you are not much of an experienced cook. Convection Oven vs. Conventional Oven: What Is Better?